Yes, I said it, Brussels Sprouts! Don’t be like Gerald & Alyson with the look of despair. My Brussels Sprouts are good…really good. After all the treats last week, and eating more treats as I packed and sent off the treats, I felt guilty that the only “green food” I’d eaten was guacamole. Needing to introduce something nutritious to my diet, I decided to prepare Brussels Sprouts. Anyway, these are seriously delicious and they’re quick. And after all the whining, my folks loved them. Still not convinced? Come on, there’s also bacon, butter & Parmesan cheese! The only prep required…trim, quarter, and rinse….In about 10 minutes, you’ll have an incredible side dish! 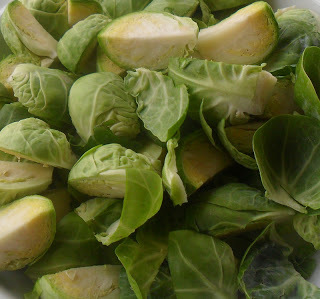 Soak and rinse trimmed and quartered sprouts in cold water to remove any grit. In a heavy saucepan, bring 4 cups water and 1 teaspoon salt to a boil on medium-high heat. Add prepared Brussels Sprouts to water, when water returns to a boil cook for an additional 3 minutes. Transfer from water onto a paper towel lined plate. In a heavy skillet, cook bacon until crispy. Crumble cooked bacon and set aside until ready to use. Using the same skillet as for the bacon, add olive oil and butter to bacon fat, cooking on medium-high heat until butter is melted and begins to sizzle. Add Brussels Sprouts to skillet and stir fry for 4-5 minutes, until they begin to caramelize on the edges. Remove from heat and top with crumbled bacon and Parmesan cheese. I know how you feel! As much as I love sweets, I’m craving veggies and lighter fare. I roasted brussel sprouts a while back, and while I found them edible, I still am not a huge fan. This recipe may be just the ticket to get me on the brussel sprout bandwagon! I actually love sprouts–I think most people have just only had overcooked ones so they think they are nasty. Love your additions, esp. the bacon! 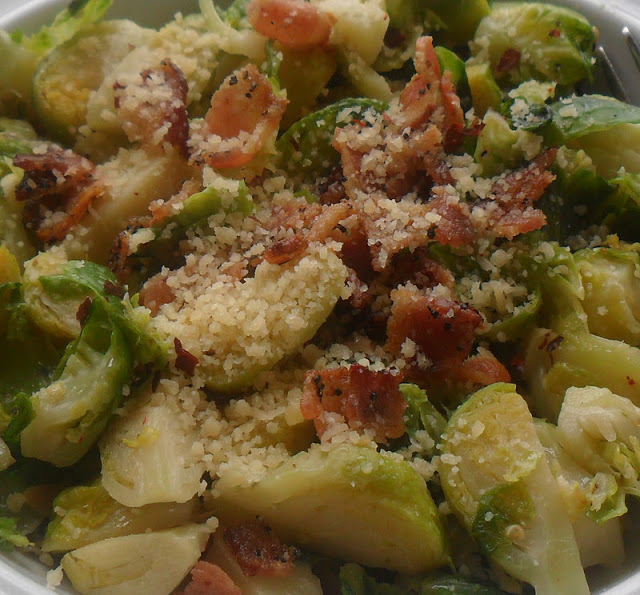 I love brussell sprouts and I make them the same way but omit the bacon. A wonderful heart healthy veggie. Yeah for the sprout! Happy Holidays. One of my new favorite vegetables! I love stir-fried brussel sprouts, especially when the leaves have that nice toasty crisp. I didn’t have bacon at home, but I threw in some salami for that savory flavor. I wonder what else brussel sprouts go with? Thanks for sharing, Shawn!